>Do you want to receive us in your Native Land, First Nation, Center, School, University, Association, Community, Town or City? PLEASE, CONTACT US IF YOU WANT TO ATTEND OR HOST THIS EVENT! We are proposing this itinerary for the beginning of this Indigenous Prayer and Healing Journey in the Turtle Island and the Four Directions. * The final schedule will be defined as soon as possible according to the support and travel assistance received, organization and interest of each area. (We are planning to visit and meet Our relatives from the Indian Nation/Indigenous Peoples in each area and celebrate Drumming Circles, Concerts with Native Chants, Indigenous Meditation Circles and Prayers for the Healing of Mother Earth. We’d like to be part of huge gatherings in Europe…and main areas around the world). The above agenda is a proposal to make it happen to come to your area. With your participation and engagement main events can take place in your community. *If you live in these areas, please contact us very soon. We’re asking you to organize for this event in your city or center. *Let us know if are you available to receive Us. It’s a honor to visit you and receive your hospitality. *We’ll be confirming the dates and the Area where will be passing as soon as be possible. Greetings from the Elders and Wisdom keepers of the Otomi Indian Nation of the Olmec Toltec Teotihuacan Lineage, the organizers of the Great Ceremony of 8000 Sacred Drums and the World Gathering for Healing Mother Earth and Peace that will take place in Mexico on the Spring Equinox of March 2018. THIS ANCIENT SPIRITUAL TRADITION have been maintained for more than 4000 years. The first great ceremony in the modern age was held in 2004 at the Otomi Ceremonial Center in Temoaya with Drumming circles joined in at least 128 countries around the world. It will continue each year in this so called Dawn of the Time and beyond. 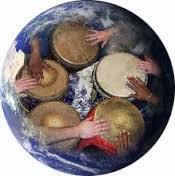 Be part of this prayer “to gather as many sacred drummers and hearts together all around the globe to continue the fulfillment of their 500-year old prophecy with the powerful intention to open healing of our blessed earth mother and Human Family”. OUR INTENTION: To start this World Tour for Peace and Mother Earth on November 2017 and will continue through 2018. We are planning to visit the Indian Nations/Indigenous Peoples, Cities and Towns in order to pass the message and the invitation of our Elders and Wisdom keepers for the Largest 8000 Sacred Drums Indigenous World Gathering on march 2018. WE PROPOSE YOU at the same time to share our traditional chants, ancestral healings and ancient wisdom through workshops, concerts, conferences, meditations and ceremonies. WE ASK FOR YOUR SUPPORT AND HOSPITALITY, to find places and local contacts for organization, promotion, transportation, lodging and food to our delegation. We propose to visit Indian Nations and Indigenous Peoples, centers, multi-cultural communities, alternative people, families and networks interested on peace and harmony on the Planet. How you can Help? THANKS for contacting us with your friends in these areas. Please, let us know your interest to receive us in your city/town, even though you live in another area. WELCOME your support and donations. Your help, love and compassion will be appreciated. We’ll be very glad to have news from you. It’s very important forus to know that you are able to receive this Indian Journey an advance. Please, be part of this initiative and contact us.